Keeping your pantry stocked with a variety of delicious ingredients is key to preparing healthy meals with ease and incorporating wholesome ingredients into your diet. Having some of the basic ingredients that I’ve listed here on hand at all times, in addition to basic meal planning, are two things that help me prepare meals from scratch without stress during the week. Here are some basic tips for stocking a healthy pantry, as well as some of the basic ingredients that I try to have on hand at all times. It’s not crucial to have every grain, spice or legume in your pantry at all times, but it’s handy to have at least one item from each category to form the base of easy meals. I’ve included more comprehensive lists here so that you can pick and choose according to your tastes and budget. Buy in bulk - Save money by purchasing non-perishable items like legumes, seeds, nuts, and grains in bulk. Although you’ll spend more money once-off, you’ll save in the long run. Invest in airtight storage containers - Being smart about storage is a great way of keeping items that you’ve purchased in bulk fresh. 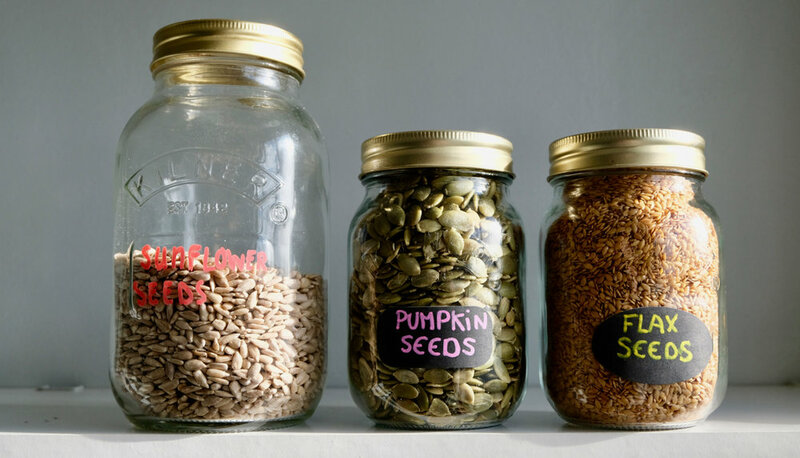 Glass jars with airtight lids are a great to use for storing seeds, grains, legumes, herbs, and spices in the pantry. Look out for specials at the supermarket - Supermarkets often have specials on things like tinned tomato, tinned tuna, and bulk rice. If you have enough storage space, take advantage of these specials and buy these non-perishable items for cheaper whilst you can. Keep track of what you have, and what you need - If you aren’t 100% sure about what you have in your pantry it can be easy to buy things at the shops that you don’t really need. Every once in a while, take a good look at what you have inside your pantry before grocery shopping. Use up items that have been sitting there for a while so that you can start from scratch. A pantry clean-up is a great thing to do every once in a while. Learn how to prepare and cook dried legumes & pulses from scratch in the blogpost I shared over here (it's not as daunting as it may seem). These ingredients are all great plant-based sources of protein and are jam-packed with gut-loving fibre! Nuts are great sources of healthy monounsaturated and polyunsaturated fats that are good for our skin, hair, hormones, hearts, and overall health as part of an overall healthy pattern of eating. They're nutrient dense, making them a great snack or addition to meals, and are packed with fibre. Each boasts its own unique taste, texture, and nutrition profile, with cashews being nice and creamy and almonds being more crunchy. Brazil nuts are great sources of selenium, whilst walnuts contain a significant amount of omega-3 fatty acids. 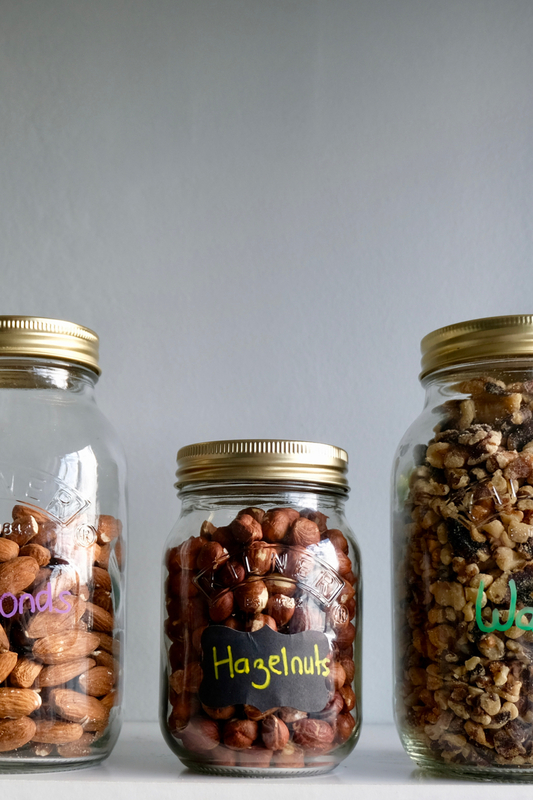 It's always a great idea to have some nuts stored in airtight jars on the pantry shelf for easy access, but to stash larger bags of nuts in the fridge to prevent them from going rancid over time. Just like nuts, seeds are great sources of fibre, monounsaturated fats, and polyunsaturated fats. Flaxseeds and chia seeds are a great source of omega-3 alpha-linolenic acid, fibre, and polyphenols. Flaxseeds are best consumed when ground before consumption as their outer shell can't be digested by humans, so we can't access all of their nutrients without a bit of help. Pumpkin seeds are great sources of omega-6 fatty acids, manganese, magnesium, and phosphorous, and sunflower seeds contain a significant amount of vitamin E.
Believe it or not, but beyond the much-loved peanut butter (I'm such a sucker for peanut butter! ), there are many other amazing varieties of nuts and seeds that can easily be made into a 'butter'. Some of the most popular versions include almond butter, cashew butter, and hazelnut butter. I've even seen amazing sunflower seed butter and 'superseed' (mixed seed) butter recipes out there. They're quite energy-dense, keeping you fuller for longer, and are packed with healthy fats, so adding a spoonful of any of these butters to a bowl of oats, slice of toast, or sliced apple makes for a great meal or snack. All of these wholegrains make for a great base for meals. All of them are amazing sources of dietary fibre, and contain a variety of vitamins and minerals that are essential to our health. The consumption of wholegrains has been linked to decreased risk of coronary heart disease, cardiovascular disease, and total cancer, and mortality related to diabetes. What I love most about the selection listed below is the diversity of textures and tastes, and their versatility when it comes to cooking. Tired of oatmeal for breakfast, why not make your porridge with buckwheat? 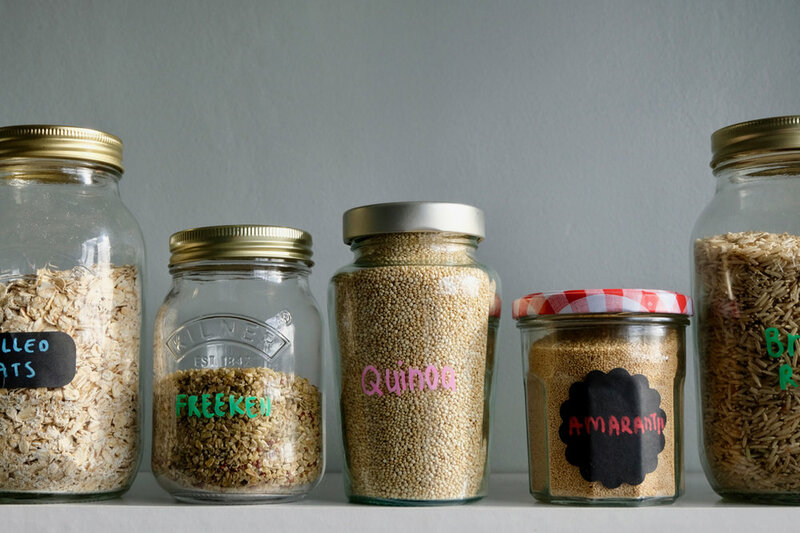 Sick of brown rice with dinner, well you can always cook up some quinoa or millet instead. These staple pantry items are very useful for making delicious homemade dressings & vinaigrettes, marinades, and pickles. When purchasing oils, it's always a good idea to choose higher quality (often a bit more expensive) oils as they tend to be more stable in the long-term and can taste a lot nicer. We don't always have time to prepare legumes from scratch, so having a couple of tins of chickpeas, lentils or beans on hand can make meal preparation that much easy when time is limited. Tinned tuna or salmon are an amazing, quick source of protein, and tinned tomatoes can form a great base for many different dishes in no time at all. Some veggies do best when stored at room temperature. Although tomatoes are best stored in the fridge when they're VERY ripe, they taste far better when left out at room temperature. Potatoes like to be stored in the dark, as do onions.